From Dr. No to Dr. Oh No to Dr. No Freaking Way over the course of a week. Rules for Politicians No. 187: The less elapsed time between the commission of a political sin and the sincere apology, the better. So if you contrive to step on your own junk on a Sunday … don’t let the matter fester until Thursday. 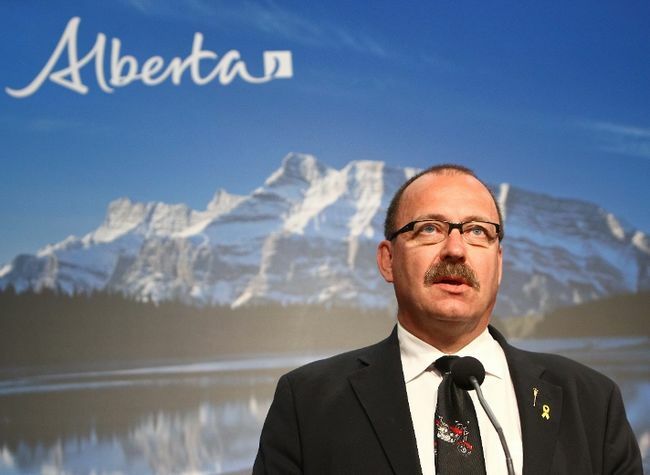 Ric McIver broke Rule No. 187 in spectacular fashion. He participated in something called the March for Jesus organized in part by self-styled street preacher Artur Pawlowski. Pawlowski is well-known downtown for feeding the hungry and shouting. He is also well-known for kneeling inside city hall telling a cop to shoot him. So God flooded your basement because Calgarians are cool with guys slow-dancing with other guys in public spaces? And Ric McIver hung out with this guy. While running for the job of top Tory and, by extension, Premier of Alberta. You can’t get elected hanging out with the lake of fire people. You can’t. Ask Danielle Smith. Politically, they’re no longer useful company. The acceptance of gay folks by Canadians has been a remarkable civil rights achievement and the vast majority who changed their views to be more inclusive are to be congratulated no less than the activists who worked so hard for those changes. That those attitudes changed is truly proof that we are a civil society. And it’s a shame Ric McIver didn’t seem to know that. He picked up the moniker Dr. No when he was Calgary city council’s leading fiscal conservative. What’s that kiddies? Fiscal conservatives on Calgary council? You don’t believe in such a thing? Just another tall tale from an old-timer? Well, it’s true. Fiscal conservatism, just like the onions we wore proudly on our belts, was just the style at the time. Anyway, old Ric lost the mayoral race to a fellow named Naheed Nenshi because Nenshi can campaign and knows how to smile convincingly. Ric’s campaign skills were less than stellar, and as his poll numbers dropped he seemed to lose the ability to bare his teeth in a pleasant fashion. He looked increasingly like a man who had been forced to eat an entire raw lemon, or watch the Oprah Winfrey Network for longer than 60 seconds. He still would have won if TV personality Barb Higgins hadn’t crashed the campaign party for reasons that only make sense if you think she was an unwitting dupe in an anti-McIver conspiracy. But he staged a comeback, went to the legislature as an MLA, and got a cabinet-level post as Minister in Charge of Signing Really Big Cheques and Cutting Really Big Ribbons With Really Big Scissors in Front of Really Big Things. Or as politicians like to call it: Minister of Transportation. Then he announced he was running for leader of the Alberta Tories. He was always probably doomed going up against Jim Prentice but his candidacy was legitimate. But Ric is the kind of guy who plays well in the sticks, where a lot of Tory power resides. Folksy. Little awkward. Fiscal conservative. Rides motorcycle. Smiles easily when things are going well. Impressive glower when it isn’t. Successfully ran big government ministry. Was proven to be the guy who put an end to plans for Alison Redford’s so-called Sky Palace. Basically, his only hope to beat Prentice, the Teflon Prince, was to portray his opponent as a carpetbagging-frat-boy-big-business-lawyer-with-Lego-hair who’s out of touch with ordinary folks. To portray him as a male variant of Alison Redford. Problem is, you don’t make your opponent look slick by making yourself look like a rube. And that’s what Ric McIver has gone and done. It’s probably too late for him to get his deposit back, isn’t it? -So when do we start to see reports about all the politicians who have been seen hobnobbing with the virulently anti-gay imams? What is so incredibly weird about this entire steaming pile of nonsense is why it is only when Christians seem to be involved that it becomes such a big deal? Unreal, quite frankly. -Robinson is a freaking tard as far as I’m concerned. I used to like his columns but lately he’s been losing it. Not one person in Calgary ,” CHANGED THEIR VIEWS ” Robinson. What BS. Calgarians have always been open to the gay lifestyle and most have no problem with it and never had. There are those who will call it the devils work just the same as there are those in every city and town in this country. If anything I would bet money you could say that more are changing their views to being against them more all the time. Not against their lifestyle but against their demanding more rights than ordinary citizens and stuffing their lifestyle down the throats of those who could really care less. I don’t care one way or the other myself but why the parades and the need for constant publicity. Live your life like everyone else and no one will really care. Yeah, McIver made a big screw up but I seriously doubt he is anti-gay. It is this very paper that is portraying him as such and will be his downfall. He likely wasn’t going to win but with this paper screaming about his mistake to the heavens every day he has no chance in hell now. This paper cost the WRP the last election also by bringing up the views of a couple of idiots constantly and every day until they had the public believing that the whole party was in cahoots with Satin himself. They say they back so and so and then do the very thing that brings that person or party down. What the hell is your explanation for that CALGARY SUN? And don’t give me any crap about just reporting the news. It was news last week. No need to drag it on daily and forever until you see a man crushed. Bunch of hypocrites. -So every politician who doesn’t march in the Stampede parade on July 4 is anti-agriculture, anti-ranching and a PETA lover? McIver is a politician, doing what politicians do when it’s time to campaign, they go where ever they need to get in front of the people whose support they will rely on to be elected. “Allahu Akbar! Terrorists outside Calgary’s city hall were chanting “kill the Jews”. July 24, 2014 Artur Pawlowski Comments Off on “Allahu Akbar! Terrorists outside Calgary’s city hall were chanting “kill the Jews”.